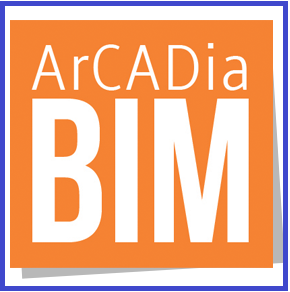 ArCADia-ARCHITECTURE is used for the object-oriented creation of professional architectural plans and sections, interactive 3D previews and realistic visualisation. 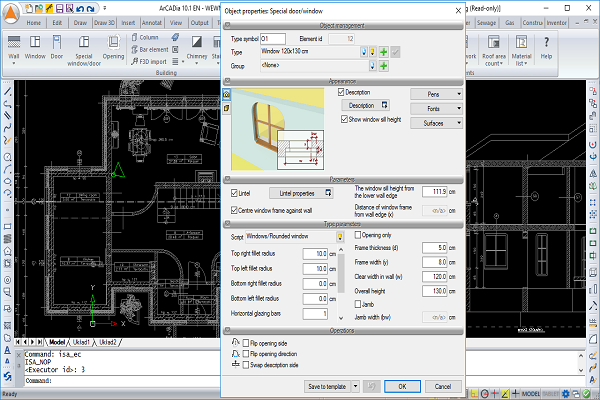 The program features specialist architectural functions, such as: automatic cross-sections, automatic dimensioning or importing object shapes from other programs. The possibility to transform a 2D drawing created from polylines or lines into the plan of single- or multi-layer walls, virtual walls or a foundation plan.. 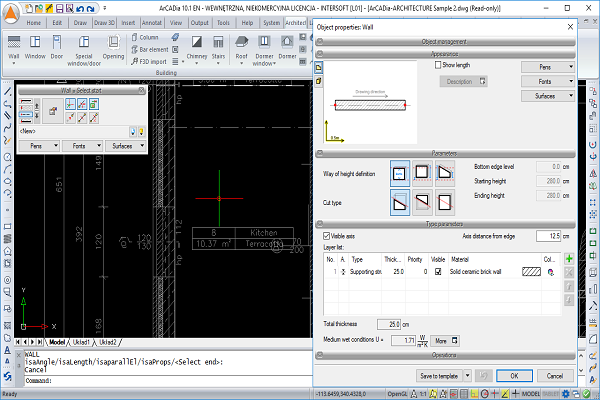 The insertion of a timber structure from the R3D3-Frame 3D program (roof slopes exported to R3D3-Frame 3D are structurally calculated, while the roof framework is returned to ArCADia-ARCHITECTURE). The insertion of roof hatches. Automatic or manual insertion of roof gutters. The insertion of drain pipes which automatically detect the gutter and the level of the terrain. Automatic or manual insertion of ridge tiles. The insertion of chimney cowls, ventilation cowls and fume cowls. The insertion of snow guards: snow fences, snow crushers and stoppers. The possibility to define the type of a roof before inserting. The tracking options are now available when inserting the roof. The possibility to insert a solar collector on the roof. A project package, which is the possibility of moving the project with imported objects to a computer where the standard object library doesn’t contain these objects. Lintels visible in the cross-section are automatically inserted with the window and door joinery. The cross-section can be automatically and manually refreshed to accelerate the work over the design. Views can be exploded, maintaining element groups and support for the Project Manager. The possibility to show a cross-section of 3D objects. The option is turned off by default, which can be changed from the Project Manager window after switching on the light bulbs. The automatic dimensioning of the entire floor plan by selecting dimensioning lines (total external, external for protruding elements, rooms and walls, windows and frames, as well as openings). 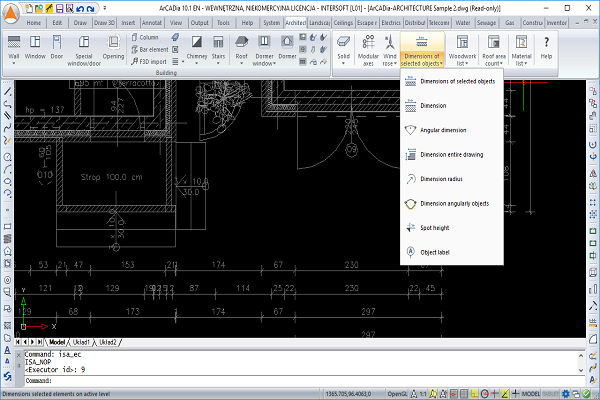 The assignment of dimensioning to objects, which enables automatic modification for all edits. The angular and radial dimensioning of walls. Dimensioning that indicates arch wall lengths. The possibility to insert a spot height in the floor plan and cross-section. Full modification of the elements of the list, adding and subtracting materials and changes to the existing materials. Automatic description of the structure of the roof truss, element numbering showing the cross-sectional size and length of the element. 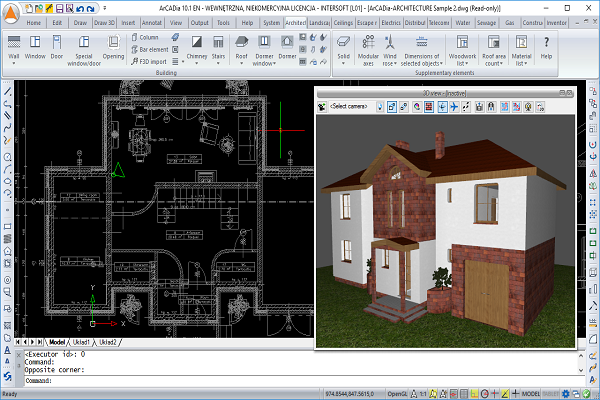 Automatically created listings of timber for timber structures inserted in the R3D3-Rama 3D program. Area and cubic capacity count. New bills that automatically add up the surfaces of: gross covered area, net and gross storey and building surfaces, as well as the cubic volume. The bills also include: the minimum plot area and roof data: inclination and ridge height. New bill of roof surface, in which the lengths of eaves, corners, roof valleys, ridges and roof edges will also be included, apart from the roof outlay and calculations of roof slopes. Automatic bill of roof accessories: lengths of gutters, ridge tiles and drainpipes, the number of caps and connectors for pipes and ridge tiles, as well as the number of cowls and snow guards. The possibility to choose which elements will be included in the bill. A bill of roof materials. Bill of materials of the objects that have been used thus far. A tally of the number of pieces, e.g. bricks, with the possibility of selecting packaging (pallets, packages, rolls), the ability to select the elements for which the list is inserted. Export of a single table of a list or several ones at the same time in a single file. An inserted bar elements list, both the ones defined in the design, and those imported from the R3D3-Rama 3D program. The possibility to introduce a ground floor and a symbol of the north arrow onto the cross section. The new version makes the compass rose dependent on the daylight analysis, coordinates the design’s location are provided or the city is indicated on the list, thanks to which rendering is calculated in the indicated bottoms and hours. Object-oriented data exchange with the ArCon program (two-directional transfer of 3D objects written in program library). Export of a design trace to R3D3-Rama 3D, ability to transfer all the roofs of the design at the same time with all the modular axes joined in one grid. Import of the structure frame from R3D3-Rama 3D from a F3D file. Simple (fast and easy to use) or advanced rendering, including the possibility to define all necessary settings (lighting type and position, shadow softening, etc.). Two renderings can be calculated in different views: daylight and nighttime views. The rendering window is independent of the ArCADia-ARCHITECTURE program, which makes it possible to continue working on a design, as the visualisation is calculated. Multi-rendering, which is recording the views from predefined cameras. 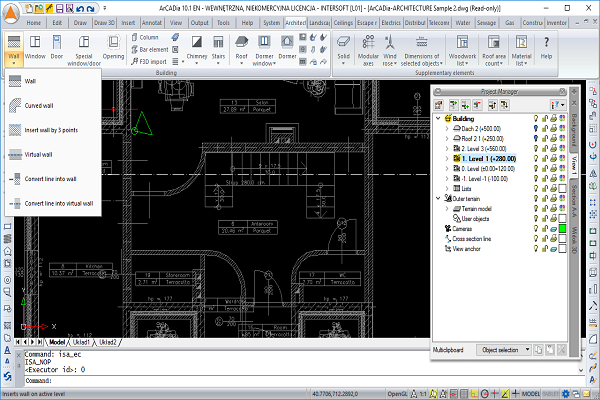 The notation of the building view with rendering as a single scene or from selected cameras as defined in the program. The ability to turn off the computer after a multi-record of rendering from the cameras introduced into the design. Daylight analysis with a date and time setting, thereby rendering a scene on the days that interest us.